When you talk about tourist attractions in Zanskar Valley, places like Drang Drung Glacier, Nun-Kun Massif, Pensi La and the twin lakes at top of the pass take precedence. A major reason behind this is that all these places are on the way from Kargil to Padum. So in order to visit, you neither have to extend your stay in Padum nor have to go someplace special for sightseeing. But Zanskar Valley is so much more that these few names really. I am not saying that the above mentioned places aren’t worth your time because they sure are; but there are also many other tourist attractions that not many people visit but are definitely a wonder in themselves. One such place that I want to talk about in this article is the beautiful Phugtal Monastery, which in many ways can aptly be termed as the hidden gem of Zanskar Valley. For a brief introduction, Phugtal Monastery, also known as Phuktal Monastery or Phugtal Gompa, is a s a Buddhist monastery located in the remote Lungnak Valley in south-eastern Zanskar. It is one of the only Buddhist monasteries in Ladakh that can still be reached only by foot. Supplies to the monastery are brought on horses, donkeys, and mules in the warmer months; and via the frozen Zanskar River in winters. A road is expected to be built up to the monastery; however, for now, it is a day’s walk from Dorzang, the end of the road leading from Padum. (Source: Wiki). Interesting fact is that this monastery is built around a natural cave and is now home to a temple, prayer rooms, a library, kitchen, living quarters, sacred spring and about 70 monks in total. Because it is located up in a cave (as you can see in the image above), Phugtal Monastery is also known as “Cave Monastery” or “Cave Gompa”. Its name Phuktal is derived from the word Phukthal; where Phuk means ‘cave’; and Tal or Thal means ‘at leisure’. An alternate spelling of the name is Phukthar, where Thar means ‘liberation’. Putting the words together, the name Phuktal Monastery means ‘The cave of leisure Monastery’ or ‘The cave of liberation Monastery’. By the whole description of it, visiting this monastery sounds like a lot of fun which it indeed is. A trek to the gompa offers you with some stunning views of Zanskar; and an insight in the simple life of Zanskari people and their Lamas. So why do people not visit here? Well for one, it is a trek up to a cave which not many people are up for. 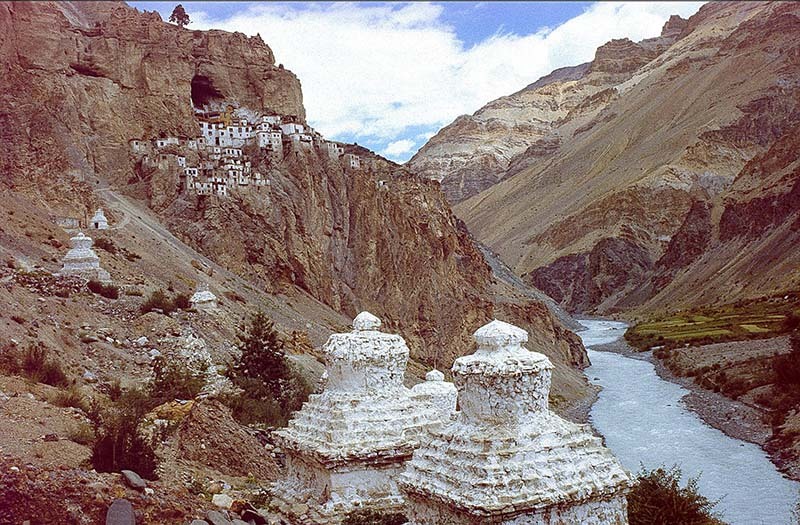 As I mentioned above, it is one of the last few remaining monasteries in Ladakh that are still accessible by foot only. In recent years, a road connectivity has been created to almost all the remote monasteries in the region but Phugtal is one that still requires tourists to walk all the way. The trek too can get a bit challenging and sometimes scary as well which not really is everyone’s cup of tea. Secondly, including Phugtal in your itinerary means adding at least 2 more days of stay in Zanskar which not everyone can afford to do. It is not a single day’s walk and to be honest, you will have to dedicate a total of 3 days to it if you want to do the trek leisurely. If rushed, you can complete it in 2 days but prolonging their trip by that many days too can be challenging for some people due to which they end up skippig Phuktal entirely. Even I did not go there during my first trip to Zanskar and only did so when I visited Zanskar for a second time last year. If however, you have the time and are up for a bit of walking up and down the hills, then a visit to Phugtal Monastery comes highly recommended. How you can plan your visit is what I will be talking about in this article. In order to get to Phugtal Monastery, you will first have to reach the small town of Padum which is also administrative center in Zanskar. From Padum then, you will drive for about 30 kilometers till the village of Ichar, also called Lchar. The road will end at Ichar and from here on, it is a walk all the way. Google map will show you a motorable road all the way till Anmo which is not really the case. The dirt road that existed earlier till Anmo was washed away in Zanskar floods of 2015 and has not yet been restored. For now, you can only drive till Ichar (and a little further after the village actually) and will then have to trek to Phuktal Gompa. Or climb up via Anmo and Chah and go back via Purne; or vice versa. I will recommend doing the trek in this manner. A minimum of 2 days is needed to cover Phugtal Monastery. If you can however add a day more and make it a 3 days trip, then it would be more fun and better enjoyable. A detailed explanation of the trek is as mentioned below. Below is a detailed description of how you can complete the trek to Phuktal Monastery. I will first explain the trek spread over a total of 3 days; which will ensure that you do the trek in a relaxed manner and indulge yourself in plenty of sightseeing. This would also required you to spend two nights staying as a paying guest in local villages; which in turn will give you some time to speak to the locals and get a taste of their culture. If you were however short on time then later in the article, I will also explain how you can complete the entire trek in 2 days; returning to Padum late in the evening on Day 2. Your route will be as mentioned below. From Padum, rent a private taxi to drop you to Ichar. You will also have to ask this taxi driver to come pick you up on your way back to Padum. If you reached Padum by your own vehicle, then you will have to leave your car or motorcycle parked at Ichar. My advice would be that you leave it parked at the hotel only in Padum and rent a cab for journey to and from Ichar. Depending on your negotiation skills, it will cost you anywhere between Rs. 3000 to Rs. 4000 for a drop to Ichar; and pick up on your way back. The small yet beautiful village of Chah will become your destination for Day 1. The journey today will be a mix of drive and trekking. Ichar, as I mentioned, is the last village accessible by road on this route. It is approximately 30 kilometers away from Padum and will take you about 1.5 to 2 hours to complete. The road in fact goes a little further ahead of the village Ichar so ask the driver to drop you as far as it goes. This will reduce your trek distance a bit. From Ichar, It will take you about 4-5 hours to reach Anmo; and then another 2 hours to reach Chah from there; so please plan your trek accordingly. Your accommodation choice is only in form of a paying guest and available at both Anmu and Chah. I will however recommend that you push yourself a bit and reach Chah on day 1 rather than breaking the journey at Anmu. If you were planning to complete the trek in 2 days then it is extremely important that you start early from Padum and reach Cha. Your stay as paying guest will be very basic and simple but comfortable. Please keep in mind that you are staying in a simple villager’s home so don’t keep your expectations too high. Food provided too will be very simple but delicious enough. If done in a leisurely manner and relaxed pace, the entire trek will not take you any more than 6 hours at most. This will give you plenty of time to spend at the Monastery talking to the Lamas and observing their lifestyle. Spend some time with your host at Cha and start by 8 to 9 AM from Cha. The trek from Chah to Phugtal is a bit narrow and tough at some places so if possible, ask a local villager to tag along. You will of course pay him for his services for the day; but it will make it easier for you to navigate and complete the trek in time rather than attempting on your own. It will take you about 2-3 hours to reach Phuktal monastery from Chah. If you reached here in time, then you can actually have lunch at the monastery with all the monks. Spend some time sightseeing in the gompa and then start on your way back but this time to arrive at the village of Purne. It will take you another 2-3 hours to trek back from Phuktal to Purne so please start your journey well in time. There are two ways that you can plan this day. You can either go from Chah to Phugtal Monastery and come back to Chah; or you can go to Purne which is on other side of Lungnak river. I personally would recommend going to Purne and staying there on this day. A third way would be to head back to Padum which I have further talked about in the article. From Purne (Or Chah if that is where you stayed for the night), you will first trek back to the village of Anmo which will take you about 2 hours to complete. Take a break at Anmo and then start walking back to Ichar which will take you another 4-5 hours to complete. At Ichar, your taxi driver will be waiting and will drive you back to your hotel at Padum. If you were short on time, then you can in fact complete the trek in 2 days as well. The journey will be a bit rushed and will give you less time to spend at the monastery; but is doable nonetheless. Your trek on Day 1 will remain the same as I explained above. You will start from Padum in the morning, drive to Ichar, start trekking and break the journey at ChaVillage for the night. On Day 2 however, start by first light of the day. Keep a good pace and target to make it to the Monastery between 9 to 10 AM. It is going to be a long trek so an early start is must. You will be walking quite a bit of distance and then also need to reach back to Padum before it got dark. Reach the monastery by 9-10 AM; spend some time there and be on your way back to Purne. From Purne, you will then trek back to Anmo and then back to Ichar village via the same route. After that, it is a an hour’s drive back to Padum where you will reach by late evening. Another way to do this trek is to spend a night at the Monastery. You can either start from Padum on Day 1 and make it to Phuktal by evening. Then on Day 2, you can go back to Padum. A better way of doing this however is to reach Cha Village on Day 1 and spend the night there. On Day 2, arrive at the monastery and spend the entire day there observing the simple lifestyle of the Lamas there. Spend some time there in complete peace and tranquility and learn about their culture. On Day 3 then, you can travel back to Padum. Stay at Phuktal can be in two forms. You can either stay at the guest house which is located about half a kilometer before the monastery. Or you can talk to the monks and ask them to give you a room in the monastery itself. They will let you stay and will accept any amount of money you offer in return. They won’t quote you a price on their own, it will entirely be your call on how much to pay. For accommodation, option of staying as a paying guest is available at the village of Anmo, Chah and Purne. If you want to stay at a guest house then that option is available at Purne or the monastery itself. Both these guest houses too are however very simple and basic but the one at Phuktal Monastery has an attached bathroom to it. A lot of people look forward to camping on the trail. If you too were carrying your own gear then you can pitch your tent at any of the villages. Please just make sure that you do not go camping in the middle of nowhere though. Camp closer to a local’s house and pay them a little to give you a spot to pitch your tent. There are shops at Anmu, Cha and Purne villages where you can buy some basic commodities. You can get some tea and snacks at both Anmo and Chah. Medical assistance is available only at Chah village at the health centre here. There is no network available at all anywhere on the route. BSNL provides coverage in Padum but the connectivity is really bad. Once you leave Padum, even BSNL will stop working and your phone will be as good as paperweight. Satellite phones are however available in the village of Cha and the monastery as well. So in case of any emergency, a call can be made from both these places. Make sure that you are bringing in at least 2 liters of water for each of the 3 – 4 hours of trekking. Carry a bottle that is not too heavy or difficult to carry; one that you can refill in every village en route. You can buy snacks as well at the villages but may also want to carry some chocolates or biscuits from Padum itself. It would also be wise to bring some basic medicines for headache, stomachache, body pain or fever along. Sun at this altitude gets very harsh and can give some serious sunburns. Please bring in a cap that can well cover your face and a sunblock lotion of highest SPF. Wear some warm clothes because it is bound to get very cold at mornings and evenings. Cold cream and Lip balm will come in very handy. The sun will be harsh not only on your skin but eyes as well so carry a pair of sunglasses as well. And I think that pretty much covers all that you need to know about trekking to Phugtal Monastery. It is a amazing places that is highly recommended. You need not have any trekking experience at all and even complete beginners can attempt this trek. If you have any further questions; or need any other details; please feel free to ask in the comments section below; or at our Community Forum; and I will be glad to answer.